Exotic, original and just a bit mysterious, Kreoo presents the Grove modular bench system. 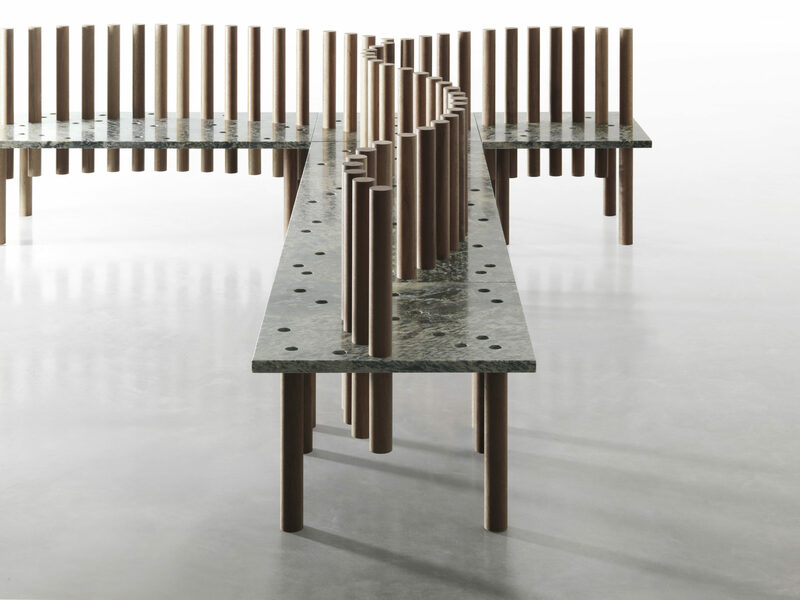 Inspired by the forests of Asia and designed by Enzo Berti with a modern Italian sensibility, Grove is a marble bench with Iroko wood pillars. The design evokes lush mangrove roots that emerge from the earth as pedestals. The wood rods form the seat’s back. The spacing of the posts creates an elegant curve that draws attention to the marble/wood combination and creates a unique face-to-face seating structure. Its versatility allows the bench to be structured in different patterns to meet the needs of any size or unique space layout. Special finishes and treatments allow Grove to thrive outdoors without any particular maintenance. Grove is ideal for contract and outdoor applications. For the slab bench seat, choose from Bianco Del Re, Crema Marfil, Emperador Dark, Grey St. Marie or Nero Marquina. Also customizable in other Kreoo materials. The upright pillars are Iroko wood.